Most people hibernate in winter but it is actually the best time of the year to shoot Australian landscapes. Sunrise times are not as early as summer. Astrophotography opportunities and conditions are much easier to handle better quality images. Looking for a quick escape from the city to soak up some nature? We all need to re-charge our batteries and learn something new. Most importantly having fun in our outside classrooms is our prime goal. These short trips last for 3 days and are not too far from Sydney, Melbourne or Adelaide. They are season and time specific. Weather can be unpredictable but with some luck you can come back with lots of amazing images. 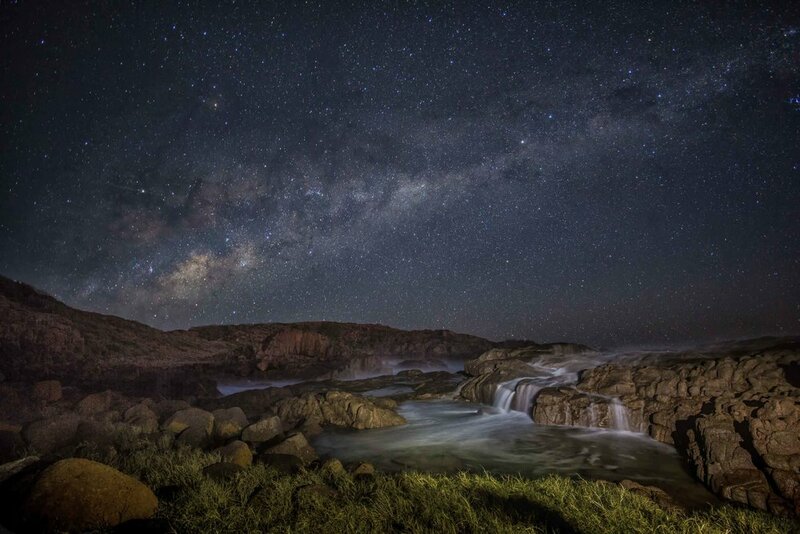 Astrophotography and rustic seascapes will be our focus from Friday night to Sunday morning. Inclusions: Accomodation, 2 nights astro, 2 sunsets/dusk, 2 dawn/sunrise & 2 Editing Sessions. Waterfalls, Ancient Forests and Seascapes will be our focus from Friday night to Sunday morning. Seascapes will be our focus from Friday night to Sunday morning. Astrophotography, seascapes and sand dunes will be our focus from Friday night to Sunday morning. Waterfalls at Wentworth and Leaura followed by Govetts Leap lookout, including sandstone escarpments, sheer cliff walls, the deep canyons of the Grose Valley, and tall waterfalls. Inclusions: Accomodation, 2 nights astrophotography, 2 sunsets/dusk, 2 dawn/sunrise & 2 Editing Sessions. The tallest pine in the world and the yellowest fields of Canola all come to life in Spring. Laurel Hill is a 5 hour drive from Sydney or Melbourne. Cootamundra is a 4 hour drive from Sydney and also worth a look. Up to 10 kg luggage and appropriate clothing, booties, raincoat, gloves.